Use a screwdriver to get underneath the old screen spline and pull it out from the channel inside the frame. 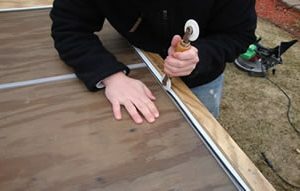 Bring the old spline, a sample of your screen and your screen frame size to the Ace Hardware so the staff can help you pick out the correct materials to create your new screen. After you’ve gone around the entire frame pushing the spline and screen into the channel, run your sharp utility knife along the outside of the spline to cut away excess screen material. You now have a new screen ready to go back into your window frame.